I finally got my iPhone version of Pocket Odds up in the store (actually it's been out for almost 2 weeks, but wanted to get version 1.1 out which fixed a few problems before announcing it). 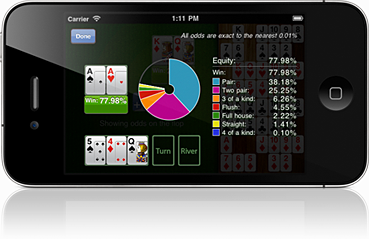 The app allows you to deal cards to up to six players and view their win/tie/equity odds for each street of a Texas Hold'em Poker game. You can also view a breakdown of the likely winning hands (see screenshot below). As with the website version all odds are exact to the nearest 0.01%. I noticed that the front page of my site is quickly filling up entirely with poker related content, I really must get some other stuff released, I'm not only interested in Poker!